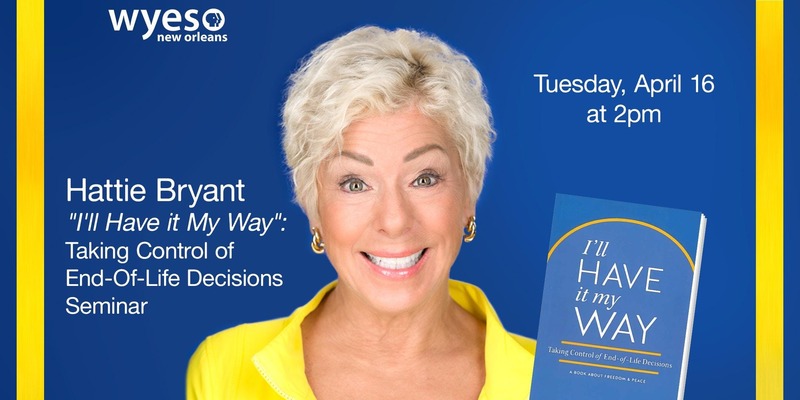 The seminar will focus on Bryant's personal experience with end-of-life planning and her determination to help others navigate the challenges involved. During the seminar, guests will enjoy Q&A with Hattie and featured panelist Dr. Kathy Jo Carstarphen of Ochsner whose special areas of interest are preventative medicine, women's health and wound care. $75 - 1 ticket + I'll Have it My Way book*In addition to any level above, as part of your WYES Membership receive a year subscription to New Orleans Magazine, WYES Passport (WYES & PBS On-Demand content any time, any place) and WYES Member Perks by Entertainment® (offering access to over 500,000 premium discounts across North America). Watch a clip of Hattie. There are no refunds. If you are unable to attend, please find a friend to give the tickets to.